38" high, 18" deep with 20" top. 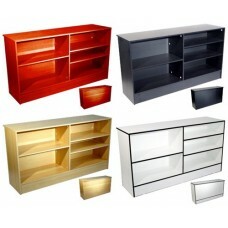 Includes - 3 - 29" adjustable wood shelves. Available in Black, White, Maple and Walnut. Cash Register Stand with Drawer and Shelf Solid, Sturdy Wood/Melamine Construction ..
48" Width. 18" Deep Body with 22" Deep Top. 9" Deep Check Writing Ledge. 42" High includes 1 Draw..
Full vision showcase. No light. Comes with glass front, top, and 2 rows of shelves, one 8" deep ..
Our Half Vision Showcases are perfect for displaying a wide range of items including jewelry, cra..
• Overall size: 84"H x 18"D x 48"L • 63" High Glass Display Area • Optional Ratchet Lock and ..
Best deals on a wide variety of used display cases ranging from 4ft, 5ft and 6ft. Used display cas..
Open Front Corner Case Available in Black, White, Maple and Dark Wood Easy Assemb..
Material:Aluminium frame,Tempered Glass. Combination Showcase. Extra Vision Showcase. E..
Material:Aluminium frame,Tempered Glass. Combination Showcase. 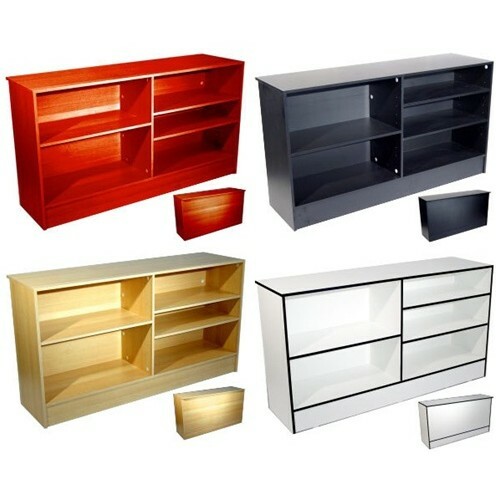 Extra Vision Showcas..
Open Front Corner Case Available in Black, White, Maple and Walnut Easy Assembly-..
48"L x 18"W x 78"H DURABLE MELAMINE LAMINATE SURFACE ALL TEMPERED SAFETY GLASS 1/4" CLA..
48" or 70" Long x 20"Wide x 38"HighDurable melamine laminate surface.Slatwall front facing for ..